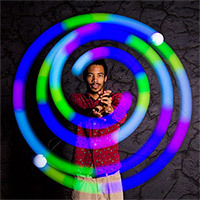 Orbits and Poi are fantastic rave toys that create incredible light trails and designs as you spin them around. 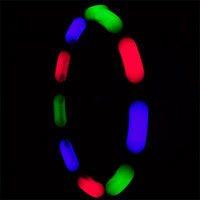 Purchase a 2 or 4 LED orbital, charge up the string and get ready to have some fun. 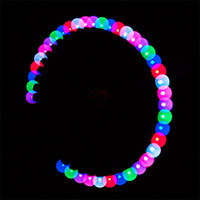 Our programmable Poi Balls are easy to use and are sure to grab some attention at raves and clubs. 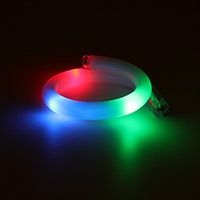 The Rainbow Bright Orbit uses Blue and Dual Rainbow RGB LED's to create a rainbow of color for your light show. 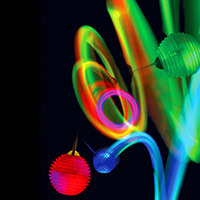 Spin balls LED Poi light up the entire spectrum of the rainbow!